This recipe was made in jest - a prod at my husband for making fun of me for making so many Wild Garlic recipes this week. So please just take it for what it is, with a pinch of humour. I've written before of my fondness of breakfasts and brunches from my childhood. Tamarind Chickpeas or Spicy Baked Beans being one of them; and this is when I thought I'd give a tin of baked beans the Wild Garlic treatment. D was laughing at my idea, but I didn't see him laughing when he was tucking into them. 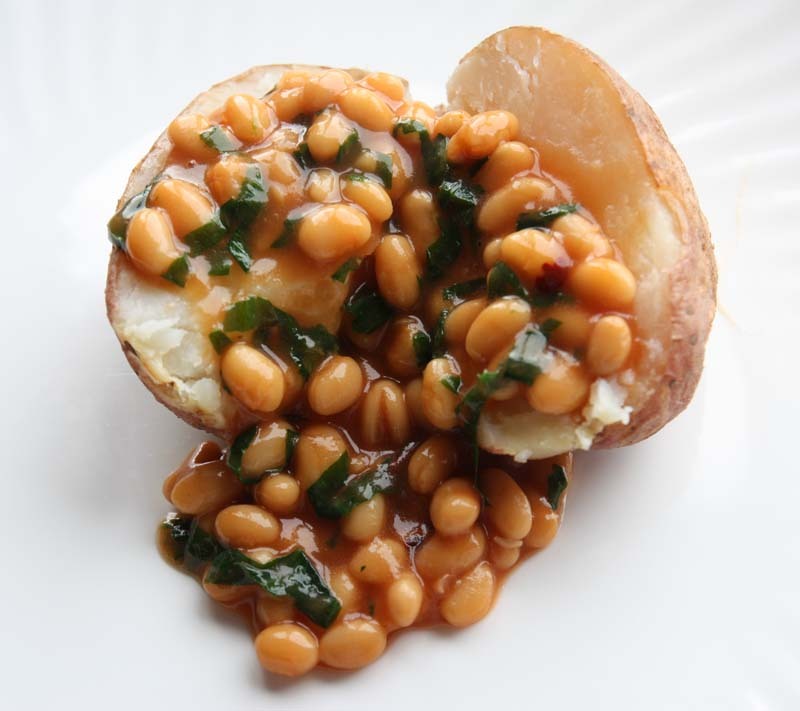 Heat the olive oil or butter in a pan, add the chilli and the wild garlic, let it simmer for a couple of minutes for the flavours to infuse, then pour in the baked beans, heat and serve immediately on toast or jacket potatoes. I have been wondering whether I've been overdoing the Wild Garlic recipes recently, and your comment has made me feel better about it. Tomorrow will be my last Wild Garlic post of the year, I think some of my readers are keeping away because of the wiff of it on my blog recently. The Wild Garlic here has just begun to flower. I have no wild garlic available where I live in Belgium, but as our plan is to move to Ireland (again) in the future, I will surely come back to these recipes and try them out. Btw, you can use the flowers in cooking too.